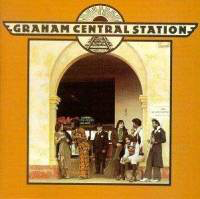 Graham Central Station were a funk band formed by ex-Sly & The Family Stone bass player Larry Graham, after his falling out with Sly Stone (over who knows what - girls, drugs...). This was their debut album. After a short vocal intro in which the group tells that they have been "waiting so long to sing their song...", they launch enthusiastically into the blatantly Sly-like brassy funker "It Ain't No Fun To Me". "Hair" just has the funkiest, grooving bass line intro, together with some funky clavinet licks and some Sly/George Clinton nasally vocals telling us "not to judge a man by the length of his hair....". Sure, man, I can dig that. The funk on this track is seriously hot at times, particularly at the point when the second vocal kicks in. They just get into a groove and keep going, occasional vocals coming in over the cookin' backing. "We Be's Gettin' Down" is a clarinet-driven slow burner, and again it is very derivative of Sly's "There's A Riot Goin' On" album. It has a great guitar break half way through. There is some good virtuoso stuff on these tracks. Again, they go on about long hair in the lyrics. "Tell Me What It Is" is an intoxicating, rhythmic brew of funky drumming, addictive percussion soulful vocals and some rubber-band bass guitar from Graham. "Can You Handle It?" is part a smooth soul song and part some Sly-style wailing above trademark funky wah-wah guitar. "People" is, I guess, the most "aware" of the songs, but it is no Marvin Gaye or Curtis Mayfield - the vocals are a bit muffled, to be honest. It doesn't really matter though. For me, this album seems more about the groove than the actual "songs". It has some red hot guitar parts on it, so don't worry about the vocals. "Why", is actually my favourite track on the album - a female vocal-led soaring slice of boiling hot funky soul. The voice is great on this one. "Ghetto" finishes the album with an insistent funk groove with some more slightly indistinct vocals. Overall, it is an enjoyable pice of seventies funk, but somehow you have a nagging feeling it just could have been a bit better.